Enzymatic Therapy Protective Breast Formula was created in collaboration with author Christine Horner, MD, FACS, an well known expert in the field of women's breast health. Dr. Horner has been a women's health activist for more than 10 years and has done extensive research into key nutritional and lifestyle interventions that promote breast health. In her book, Waking the Warrior Goddess, Dr. Horner identifies 5 factors critical for breast health, including: Hormonal balance, Detoxification, Immune support, Defense against free-radical damage, and Balance of the natural inflammatory response. 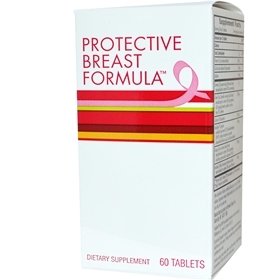 Each ingredient in Protective Breast Formula provides demonstrated breast health support. The natural immune boosters and antioxidants include: Indoplex Complex with DIM, green tea extract, maitake D-fraction, turmeric, vitamin D3 cholecalciferol, and grape seed extract. When used in conjunction with a balanced diet and healthy lifestyle choices, these ingredients provide superior support for breast tissue health. DIM, has been shown in scientifi­c studies to reduce the risk of breast, cervical and other estrogen-driven cancers cancer by helping the body to make a better balance of the good estrogen compared to the bad estrogen. It neutralizes the harmful by-products of estrogen. Enzymatic Therapy is an industry leader in laboratory testing and developing well-researched products. They publish this research in scientific, peer-reviewed journals, and the final result is a line of cutting edge, innovative products whose efficacy is unparallelled. Directions: Two tablets daily with food. If desired, take one tablet twice daily with food. For more active support, take two tablets twice daily. Notes: Caution: Do not use if pregnant or nursing, or if sensitive to caffeine. Not recommended for children under 18 years of age. Harmless changes in urine color may occur with the use of this product. If taking prescription drugs, consult your healthcare practitioner prior to use.